Shutdown hangs in md kworker after "Reached target Shutdown." I'm booting a fully patched 16.04 from an Intel Rapid Storage Technology enterprise RAID1 volume (ThinkServer TS140 with two SATA ST1000NM0033-9ZM drives, ext4 root partition, no LVM, UEFI mode). If the RAID volume is recovering or resyncing for whatever reason, then `sudo systemctl reboot` and `sudo systemctl poweroff` work fine (I had to `sudo systemctl --now disable lvm2-lvmetad lvm2-lvmpolld lvm2-monitor` in order to consistently get that). However, once the recovery/resync is complete and clean, the reboot and poweroff commands above hang forever after "Reached target Shutdown.". Note that issuing `sudo swapoff -a` beforehand (suggested in the bug #1464917) does not help. [ 1.246271] md: md126 switched to read-write mode. [ 1.247325] md: minimum _guaranteed_ speed: 1000 KB/sec/disk. [ 1.248269] md: using maximum available idle IO bandwidth (but not more than 200000 KB/sec) for resync. [ 1.248774] md: using 128k window, over a total of 976759940k. May 30 17:26:07 wssrv1 systemd-udevd: Process '/sbin/mdadm --incremental /dev/sdb --offroot' failed with exit code 1. May 30 17:26:07 wssrv1 systemd-udevd: Process '/lib/udev/hdparm' failed with exit code 1. May 30 17:26:07 wssrv1 systemd-udevd: Process '/sbin/mdadm --incremental /dev/sda --offroot' failed with exit code 1. May 30 18:17:02 wssrv1 kernel: [ 3106.826710] md: md126: resync interrupted. May 30 18:17:02 wssrv1 kernel: [ 3106.836320] md: checkpointing resync of md126. May 30 18:17:02 wssrv1 kernel: [ 3106.836625] md: minimum _guaranteed_ speed: 1000 KB/sec/disk. May 30 18:17:02 wssrv1 kernel: [ 3106.836626] md: using maximum available idle IO bandwidth (but not more than 200000 KB/sec) for resync. May 30 18:17:02 wssrv1 kernel: [ 3106.836627] md: using 128k window, over a total of 976759940k. May 30 18:17:02 wssrv1 kernel: [ 3106.836628] md: resuming resync of md126 from checkpoint. I attach screenshots of the hanging shutdown log after a `sudo sh -c 'echo 8 > /proc/sys/kernel/printk'`. 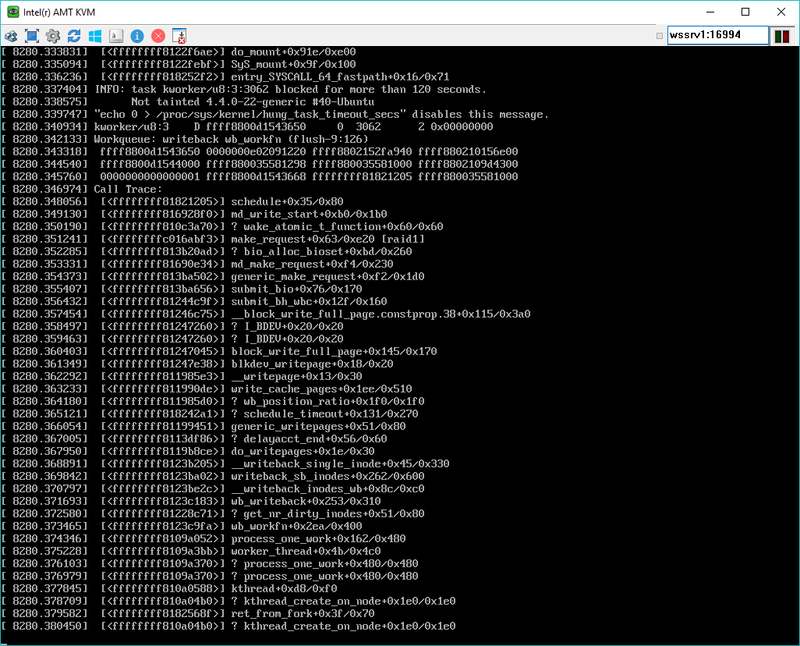 The second screenshot shows that the kernel has deadlocked in md_write_start(). Note that `sudo systemctl start debug-shell` is unusable on this machine at this point because Ctrl+Alt+F9 brings tty9 without any keyboard. I have also tried with much lower values for vm.dirty_background_ratio and vm.dirty_ratio, but to no avail. Linux 4.6.0-040600-generic_4.6.0-040600.201605151930_amd64 from http://kernel.ubuntu.com/~kernel-ppa/mainline/v4.6-yakkety/ did not help either. The shutdown now also hangs during a resync. So it behaves inconsistently. I update the subject and the description to reflect this. + Shutdown hangs in md kworker after "Reached target Shutdown." Possibly also related to 1320402 (as the unnecessary resync probably follows the incorrect stopping of the array). I still get the same issues with a fully updated Ubuntu Server 16.04.1 LTS (Linux 4.4.0-45-generic). The patch from https://bugs.launchpad.net/ubuntu/+source/mdadm/+bug/1320402/comments/13 does not seem to have any effect on these issues. With or without the patch indicated above, this kernel seems to fix the spurious verify issue (so far...), but not the hanging reboot and poweroff. This is an unmaintained kernel intended for debug purposes and not for production anyway. I attach a hanging reboot log with Linux 4.8.4-040804-generic and the patch indicated above, with dynamic debug enabled in drivers/md/*. It hangs when remounting '/' read-only, still in the md kworker. 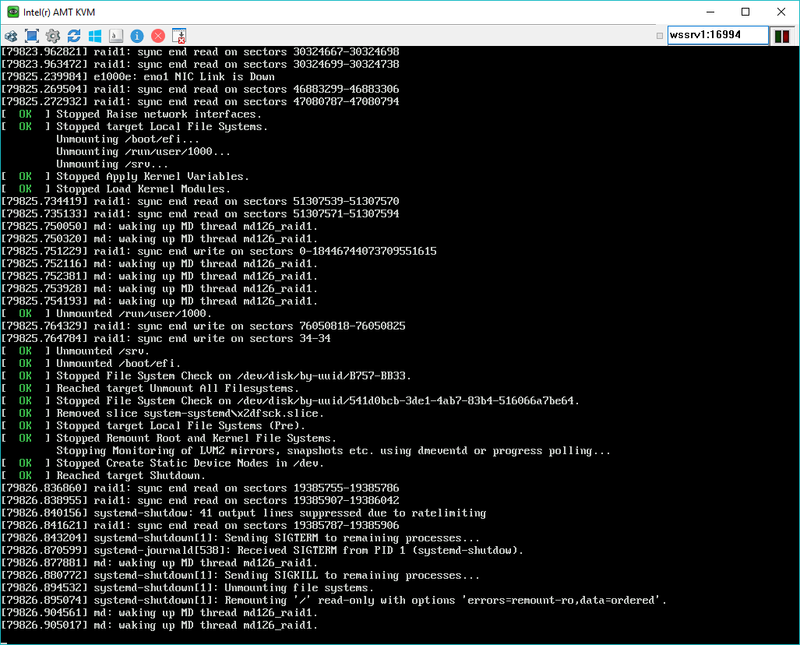 Then, I tried to install upstart-sysv to see if getting rid of systemd helps, and it does. With upstart-sysv, all the issues described here seem to be fixed with Linux 4.4.0-45-generic and no patches. This seems to confirm that these issues are caused by systemd. However, I don't know how reliable and tested upstart-sysv is on Ubuntu Server 16.04.1 LTS, so this might possibly be an issue for a production server. I would prefer to keep working with systemd. With upstart-sysv, I have now observed a spurious RAID1 verify following a reboot after an unrelated apt upgrade (libc stuff). It's the only spurious RAID1 verify that I have observed so far with upstart-sysv. So upstart-sysv is not perfect, but still better than systemd-sysv regarding these issues. 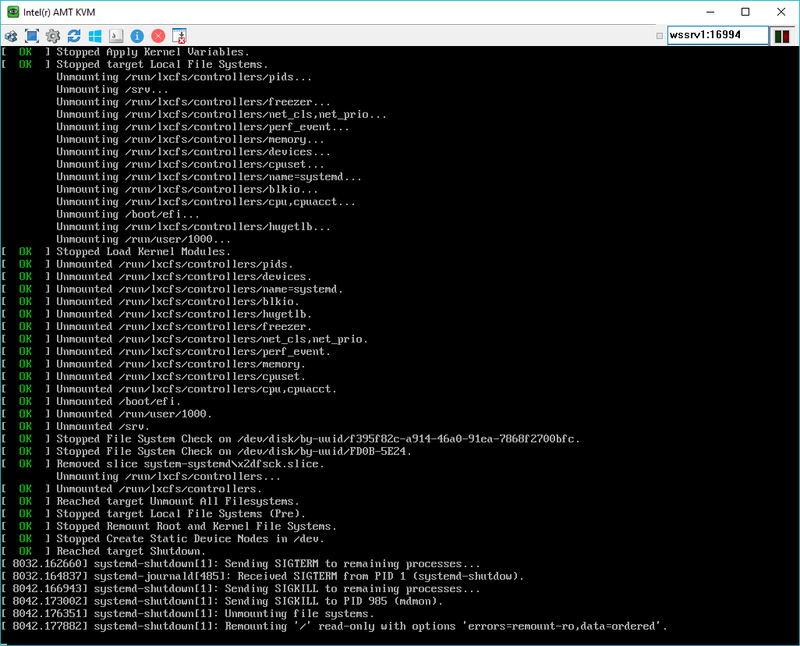 Also, after one reboot, I got my ext4 rootfs mounted ro without any apparent reason (no errors in the logs). Everything came back to normal after another reboot. I think I will try Debian, CentOS, and maybe Windows. I have a similar problem with a super micro X10DRH system board. If I have the intel sata controller set to ACHI and install a fresh instance of 16.04 the server works without issue. If I have the intel sata controller in RSTe RAID mode with a 2 drive RAID1 configuration the server will hang on reboot at the 'Reached target shutdown" message. Are there any logs that I can provide to assist in troubleshooting? Confirming this same issue for me on a clean install of Ubuntu 16.04.2 X64 server on a HP 8300 Elite SFF pc. Anything I can collect to troubleshoot? Same problem with a SuperMicro Board X11SSH-F with Intel C236 Chipset and two sata disks. Installing the server with bios sata mode "RAID" and a RAID1 configured in the Intel Raid bios (Ctrl+I), on a fresh Ubuntu install and also on updated Ubuntu 16.04.2 the server doesn't restart or shutdown, it hangs at "Reached target shutdown". Installing the server with bios sata mode "AHCI", so without configuring something in the Intel Raid bios, but configuring a RAID1 only direct at Ubuntu as mdraid, restart and shutdown work fine with fresh install and also with all updates to 16.04.2 as expected. May I ask, if this bug will be solved in the future, and if there is a timeline? We planned to buy a lot of this servers, install Ubuntu and put them in a data centre miley away, but we can't wait another year. It someone in Germany really is able and willing to solve this bug, I would be willing to lend our server for some weeks. HP Z230, Intel Raid bios, Ubuntu 16.04.2. Confirm on HPE ML10 gen9. Intel SATA RAID - RAID 1. Intel SSD. 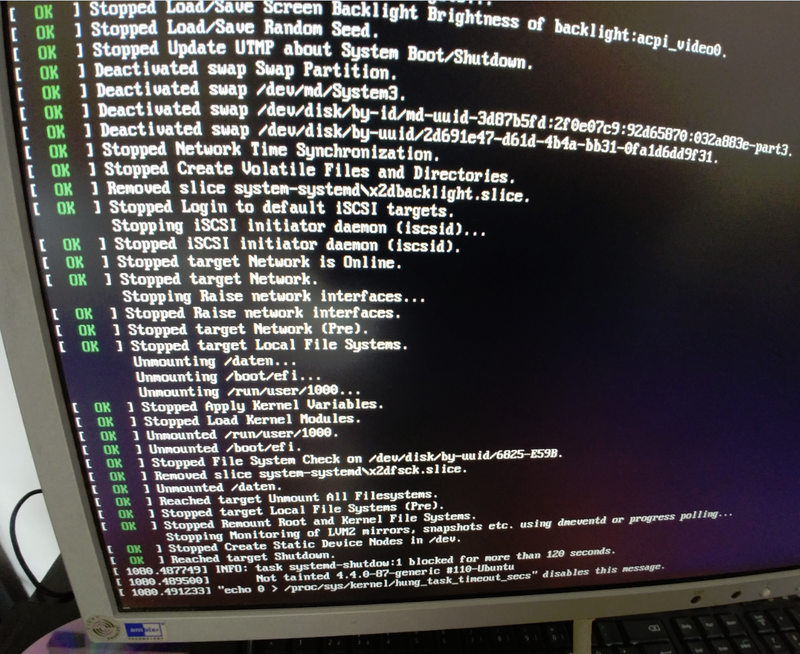 Shutdowen/reboot hangs (kworkers) and Raid is rebuilt on every "reset"
Is Ubuntu still running mdmon from inside the root fs and killing it before r/o remount? I am now pondering what to do with a set of file servers running 16.04 and root on an IMSM RAID. I got a number of systems with similar hardware running CentOS 7 just fine with no issue on reboot. I see elaborate handling of mdmon in systemd units on CentOS … including the --offroot command line parameter that I don't see documented anywhere. KillMode=none might also play a role in the mdmon@.service file. With that, the mdmon instance from the initrd persists (with @sbin/mdmon as argv) and is not killed by systemd. So systemd-reboot does not hang. But: Since mdmon is not killed at all now, the array always gets a fresh resync on each boot. We really, really need to implement the return-to-initrd practice to be able to bring the system down in the proper reverse order of bringing it up. as a workaround. as I have to wait for the sync, I can't report now. of course that's no fun @ for remote machines. ps. the servers were on centos before, I did not have any probs there ?! Well, of course effects are a pain. The sync is only 256G SSDs im my case. Main point is that the fix is known since many years and should hopefully be quickly adaptible to Ubuntu. Or not … if it is really necessary to switch to a return to the initrd like Fedora. I wonder if 17.04 has this fixed. Can someone comment on that? Is the proper initrd buildup/teardown implemented there? I cannot test this on my servers as they are needed in production. Is anyone working on this? I see that the bug is assigned, but apart from that only messages from affected users. was ok. The Raid was not rebuilt. a BIOS reconfig. from "RAID" to "AHCI" did not change anything. Can we get any reaction from Ubuntu on this? Is the needed reworking of the initrd about to happen for the LTS or is this a WONTFIX and root-on-Intel-Matrix-RAID is simply not supported? It is clear what has to happen to make things work again with systemd and mdadm/mdmon. Will it happen? I would just like to inform you that this bug appear since last CentOS 7.4 update, 7.3 was ok.
Maybe it should be reported to Systemd Issues ? The reference is valuable nevertheless … not least because I have systems about to be upgraded to CentOS 7.4 that might get hit by this bug! as part of https://bugs.launchpad.net/ubuntu/+source/mdadm/+bug/1722491 there is currently mdadm update available from xenial-proposed and zesty-proposed that might resolve this issue. I added a comment about this new fix on https://bugs.launchpad.net/ubuntu/+source/mdadm/+bug/1608495. One thing I wanted to add here, for the first time shutdown completed successfully. In fact, I was a little startled when it happened. :-) It powered off at the end of shutdown, instead of hanging at the "Reached target Shutdown" message. One question: Does this mean that Ubuntu 18.04 will use mdadm by default during installation instead of dmraid? I really hope so. It's a real pain to do it manually. I followed the steps from #27 and everything works fine now on 16.04.3 with a SuperMicro Board X11SSH-F with Intel C236 Chipsets RST and two sata disks as Raid 1. I can also confirm #28, the first reboot still needed a hard reset and a rebuild of the Raid 1, but after this, every (>10) shutdown and reboot was OK.
And the solution still is alive after an update on the newest 4.4.0-116 kernel today. Sorry for testing delay, but after missing a solution for too long time, we installed our servers different way, only this week I got a new testing machine until 18.04 is out. john-center - I believe mdadm is used by default, instead of dmraid. However, I'm not sure if we do correctly activate Intel Raids with mdadm. I have not done an install with either 16.04 or 18.04. Or I guess at least start the install up to the partitioning screen. My expectation is, if one has raid arrays pre-setup in BIOS (ctrl+I on boot) already, they should show up as assembled and offered to be autopartitioned. With both 16.04 and 18.04. > john-center - I believe mdadm is used by default, instead of dmraid. > both 16.04 and 18.04. I know with 16.04 it wasn’t used by default. I had to do a lot of manipulation to set up the raid array before I could do the install. It used dmraid once it detected the imsm raid. I removed dmraid completely, then installed mdadm, assembled the array & ran the installation program again. I was hoping that mdadm would just do it all instead. > Shutdown hangs in md kworker after "Reached target Shutdown." > ST1000NM0033-9ZM drives, ext4 root partition, no LVM, UEFI mode). > If the RAID volume is recovering or resyncing for whatever reason, then `sudo systemctl reboot` and `sudo systemctl poweroff` work fine (I had to `sudo systemctl --now disable lvm2-lvmetad lvm2-lvmpolld lvm2-monitor` in order to consistently get that). However, once the recovery/resync is complete and clean, the reboot and poweroff commands above hang forever after "Reached target Shutdown.". Note that issuing `sudo swapoff -a` beforehand (suggested in the bug #1464917) does not help. > [ 1.246271] md: md126 switched to read-write mode. > [ 1.247325] md: minimum _guaranteed_ speed: 1000 KB/sec/disk.